If you are looking for the best whipped Shea Butter, you should already know about the benefits of using whipped shea butter on your skin and hair. Comparing shea butter to whipped one, we can say that whipped is more easily applied. It has a creamy, rich but light to the touch texture which feels luxurious when applied on the skin and works well to provide your hair with all its benefits. A good quality whipped shea butter for skin shouldn’t be greasy or clog the pores. It should soften those dry patches and moisturize your skin well, making it softer and smoother. It is also a natural product that is used successfully for cracked parts of skin. Its healing properties can prove to be particularly useful for specific skin issues such as eczema, psoriasis or rosacea. 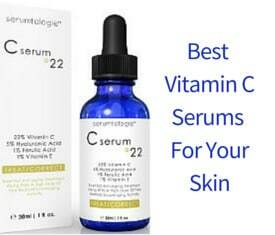 Its antioxidant properties will also help in the prevention of premature wrinkles and fine lines. Something else you should be aware when you want to buy whipped shea butter is its full list of ingredients since filling a natural product with unnecessary and oftentimes harmful chemical ingredients won’t be as beneficial and safe as using a pure whipped shea butter product. So, after some research on whipped shea butter available on the market which took me enough time since I had to dig a bit deeper to each product so that I finalize a selection of products that I would be pleased with, here’s my final list of the best whipped shea butter based on the products quality, the organic and natural ingredients they contain as well as the good customer reviews. 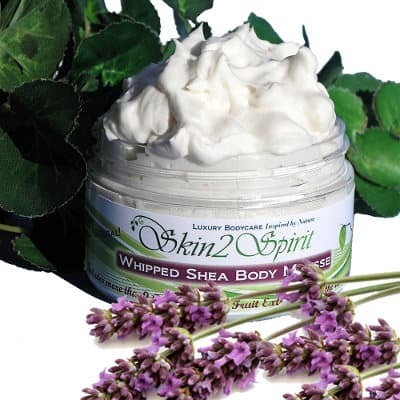 Skin2Spirit Organic Shea Body Mousse is a fluffy body cream made to give your skin the nutrients it needs to remain healthy and beautiful. Comes in a variety of scents including: Chocolate souffle, French Lavender, Fresh lemon berry, Joy Citrus Mix, Honey Almond, Lavender Vanilla, Strawberry Ice cream, Summer rose, Banana Coconut (how much more yummy that can be?) and Unscented. No synthetic Ingredients, toxic chemicals, parabens, Petrochemicals, Phthalates, SLS. Packed with 10 anti-oxidants, anti-aging super fruits/foods. Vegan, gluten free and animal friendly. Organic Aloe, Grapeseed Oil, Jojoba oil, Shea Butter, Vegetable Emulsifying wax, Cocoa butter, Essential oils and/or organic flavors, Green tea extract, Vegetable Stearic acid, Organic extracts of: Acai, aloe, blueberry, Brown seaweed, Goji, Grapeseed, Mangosteen, Noni, Sea Buckthorn, Pomegranate, Potassium Sorbate, Silver Dihydrogen Citrate, Citric acid, Water. Apply daily after bath all over your body for complete moisturizing. The product should be used within 6 to 12 months of opening but you can extend the shelf life by refrigerating. Because Skin2Spirit Organic Shea Body Mousse is all organic and hand whipped, it is made to be ordered in small batches, with the date shown right on the container so you know exactly when it was made. This is that one extra step that most product manufacturers don’t seem to make any more, and puts this Body Mousse in a class of its own. 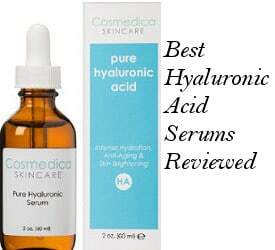 Keeps Skin Hydrated– It holds in skin’s natural moisture leaving it feel softer, silkier and more healthy. Absorbs Quickly– Consumers also find that it absorbs quickly and doesn’t leave behind any greasy feeling. 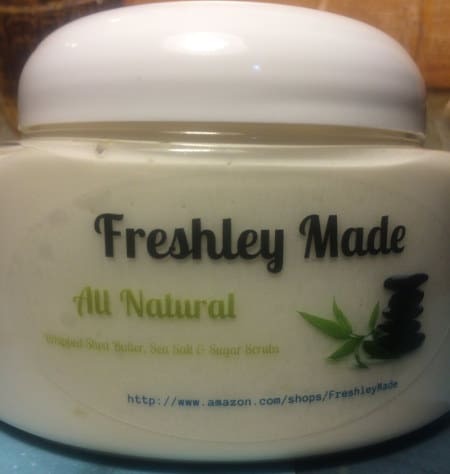 Freshley Made All Natural Whipped Shea Butter is made in small batches and can be used to moisturize both your hair and skin. 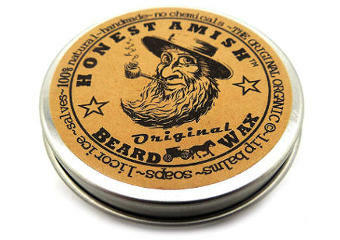 Scents include: Almond, Eucalyptus, Eucalyptus spearmint, Jasmine, Lavender, Lemon, Peach, Peppermint and Unscented. Pure unrefined raw Shea butter with certified organic jojoba oil, avocado oil, and grape seed oil. Natural sun screen and moisturizer also corrects eczema and other related skin issues. Unrefined raw Shea butter from Ghana, 100% organic Jojoba oil, grape seed oil, and avocado oil. No chemicals or preservatives. Apply to wet or dry hair and/or skin daily. Reviews for the FreshlEy Made scented whipped Shea butter are extraordinarily positive. Almost every users who has tried this whipped Shea butter loves it and finds it has several benefits for both hair and skin. More Manageable Hair– It leaves hair silky, and more manageable making it easier to brush and comb with less hair loss. Improves Condition and Texture of Skin– Consumers who use this butter have found that their skin has a more even skin tone and a softer smoother texture. They also say that it leaves their skin with a healthy glow. Perfect for after baths, or for whenever dry skin is a problem, this Organic Aloe Vera and Shea Body Butter is perfect for those with normal or dry skin helping to turn that alligator skin to skin that is soft and silky to the touch while healing those chapped dry hands, feet, and elbows and holding in the skin’s moisture. This organic product combines healing aloe vera with moisturizing Shea butter to help heal dry, damaged skin, and leave it feeling softer and smoother. Infused with peppermint and Lavender essential oils for a relaxing feel and wildcrafted green tea for anti-oxidant protection. 98% naturally made with organic Aloe Vera, Shea butter, Sunflower Oil, Jojoba oil, Vitamin E and essential oils. Ultra moisturizing cream that is non greasy. Made in small batches to help ensure freshness. Organic Aloe Vera, Organic sunflower oil, Palm oil, Shea butter, Glyceryl Stearate, Cetyl Alcohol, Stearic acid, Kosher vegetable Glycerin, Lavender essential oil, Peppermint essential oil, Jojoba oil, Vitamin E, Vitamin B5, Phenoxyethanol, Ethylhexyl glycerin, Xanthan gum, Allatonin, Wildcrafted green tea, Citric Acid. 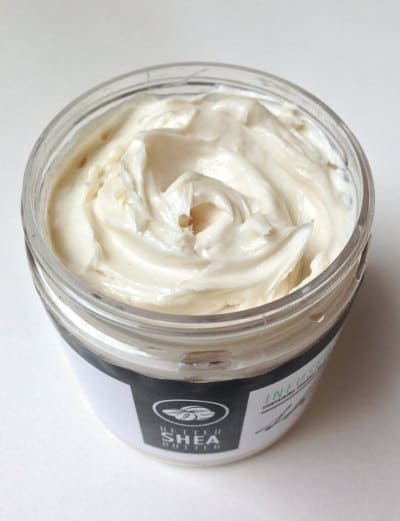 Reviews and ratings for this Organic Aloe Vera and Shea body butter are extremely positive with the majority of users finding that this body butter actually improves their skin’s health. Little Goes A Long Way– It doesn’t take much of this body butter to cover your skin, making it a great value because it lasts long. Moisturizes well– Most consumers find that this is an excellent moisturizer, allowing their skin to retain more moisture which results in smoother and softer skin. In cases, where skin was dry and cracking, it did take several days of applications before users saw results, but they did state that results were dramatic. In conclusion, after reviewing some of the best whipped shea butter products, we can say that whipped shea butter can do wonders for your skin, holding in moisture and leaving your skin (and in some cases hair) looking and feeling more healthy.